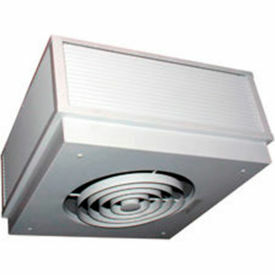 Wall Heaters Provide Temperature Adjustment For Factories, Assembly Rooms, Warehouses, Garages And Other Enclosed Areas. Wall Heaters can be mounted to wall using included hardware. Solidly manufactured for long lasting durability and dependability. These convection heaters raise temperatures gradually to a comfortable level. The average minutes to achieve a 20°F to 90°F temperature rise depends on the area to heat and the size of the heater. See the specifics for each model to size your needs. Durable steel venturi housing includes finned tubular heating elements to provide steady heat source and long lasting durability. Wall Heaters have safety yellow or orange enclosures and screens on both air intake and output openings to provide operational safety. Control knobs control fan operation and thermostat adjustment from 40-100°F. High-limit thermal cutout switch provide ease of use. Wall heaters are designed for direct wire installation. Access panel allows direct wiring connections. Optional 25'L power cord for some models sold separately. Available in Single and 3-Phase Units. Voltages are 208, 240 and 480 volts. CSA and cETLus listed. Temperature rise ranges, BTUs, dimensions and heating coverage areas vary per model. Fan Forced Ceiling Heaters Provide a Temperature Controlled Environment For Various Applications Including Commercial, Industrial, Corporate, and more. These heaters allow you to choose wattage during installation to support different climates while improving energy efficiency. The manual reset thermal limit and steel block fin element are designed to improve operational safety and efficiency. The 18 gauge steel construction is both strong and durable to ensure years of reliable service. The white powder coat color finish helps improve the ceiling appearance while preventing rust and oxidation. Includes drywall depth embossments on the rear of the unit. UL approved. Watts and BTUs vary per model. 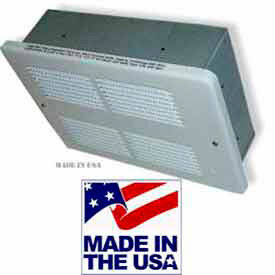 Ceiling heaters mount to an electrical junction box installed in the ceiling (not included). 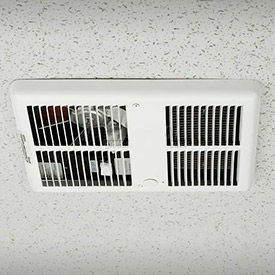 These surface mounted ceiling heaters have a 20 gauge steel grill with white powder coat finish. 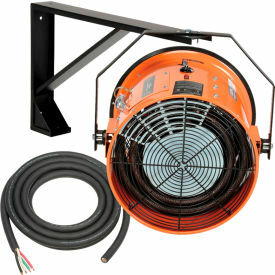 Ceiling heaters feature an enclosed steel fin sheath element. Propeller fan blade is powered by a 1300 RPM motor, offering 425 CFM. Radial diffuser. 208V, 240V and 277V Heaters feature a manual reset thermal limit. 480V Heaters feature automatic reset thermal limits, 24V control transformer and a 24 volt relay. 1 Year Limited Warranty. King Electric Forced Air Ceiling Heaters Are Designed For Bathrooms, Storage Areas, or Other Applications Where Ceiling Installation Is Needed. 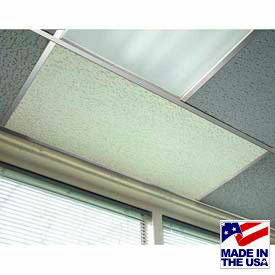 King electric forced air ceiling heaters enable heating circulation from elevated vantage points. Quiet running, convection heat units with solid steel front covers and baked enamel almond finish. Select models feature dual open coil element, C-frame motor, squirrel cage blower, and quieter. Units are solidly manufactured for lasting durability. Specifications vary per model.